Mazatlan Scuba Diving - Save 10% and Free Beach Club! Mazatlan is not a developed scuba diving destination, but that doesn't mean that there is nothing to see here. What it does mean is that everything in our sea is still natural, alive, and growing. Scuba Diving in Mazatlan is primarily done around the three islands of Pajaros, Venados and Lobos, where tropical fish are abundant and the calm, crystalline waters are ideal for scuba diving. After your scuba diving trip, you can relax and enjoy yourself at the brand new Posada Freeman hotel, with its full service bar and restaurant, and enjoy full use of the beach and beach facilities absolutely FREE*. It's our way of saying thank you for choosing us for your water sports here in Mazatlan. Cruise Passengers: Yes! This excursion is available to you and will work with cruise schedules. You pick the start time! 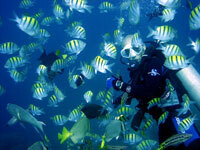 Requires: PADI, NAUI, SSI or other Open Water Certification Card, or completed Discover Scuba Diving course. Kids: Ages 10 and up, provided they have the required certification. Kids are the same price as adults.